When writing my chapters in The Economics Anti-Textbook, probably nothing got me more worked up than the things I read about the murderous asbestos industry and the politicians-without-principle who cater to it, particularly the Canadian ones. Space constraints being what they are, I only wrote a page about it (pp.161-162), but I thought it made a good example of what happens when poor and asymmetric information meet Mancur Olson's dictum about how 'there is a systematic tendency for 'exploitation' of the great by the small' (p.111). Today, the CBC's website has a brief report in its 'offbeat' section (reserved for 'Man bites dog' stories) about The Daily Show's mockery of Asbestos, Quebec, a town with an asbestos mine. The story also has some more serious information, noting how despite considerable opposition, the Quebec government last month approved a loan guarantee for the company running the asbestos mine, which will enable it to expand production considerably. The original CBC report, from 13 April, has a remarkable subheading in it: 'Opinions divided on asbestos' and states "Several studies have linked asbestos dust with cancer and lung disease. Its proponents say the product can be safely used when handled properly, and under certain conditions." Several studies?! Writing this suggests that perhaps the finding of a link is preliminary and not overwhelmingly established. (Some facts about mesothelioma can be found here.) And who are "its proponents"? It tactfully doesn't say that they are just that scourge of the modern world, industry flacks who will say anything for money. And what about the dumping of asbestos waste in Third-world port towns? The asbestos is already FULLY airborne. Look at the mine for peat sake. Stopping the use of it will do nothing. 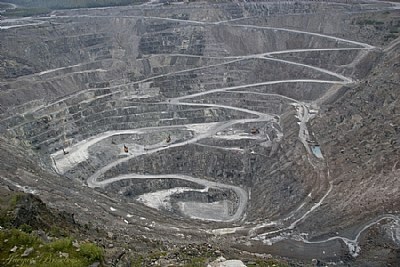 The air still wil pick up the partials in this giant gapping hole of a mine and sweep it around the globe. The stuff has been air born for as long as it's been being dug from the ground. People are BLIND they cannot see a gapping hole letting them particles fly to and fro from the god driven wind.